Polo coach Stephen Roberts, D.V.M. ’38, with the 1968-1969 Cornell Polo Team varsity players. On horseback, left to right: Dan Ladd, Dr. Doug Antczak ’69 and Bill Armstrong ’70. Standing, left to right: Paul Wilson and Jeff Springer ’69. Two horse breeding specialists have received lifetime achievement awards from the International Symposium on Equine Reproduction (ISER). Cornell alumni Doug Antczak and Walter Zent were among five veterinarians and scientists from the United States, Canada and England who were honored this summer at the ISER meeting in Cambridge, England. But each chose a different path: Antczak became a professor at the College of Veterinary Medicine, where he has conducted groundbreaking research in equine pregnancy, while Zent joined one of the world’s top equine practices and specialized in Thoroughbred breeding in Kentucky. Antczak, the Dorothy Havemeyer McConville Professor of Equine Medicine at the Baker Institute for Animal Health, has made pioneering discoveries in equine reproduction over the past 40 years. His work has focused on the mother’s immune system during pregnancy and the role of the placenta in protecting the embryo from potentially lethal maternal immune responses. Zent, recently retired from Hagyard Equine Medical Institute in Lexington, was honored for his contributions to Thoroughbred breeding management, a subject on which he has published widely and presented to equine organizations across the country. Since meeting at a polo match, Drs. Doug Antczak (left) and Walter Zent saw each other frequently at Cornell, in Lexington and at equine conferences around the world. They are pictured here after receiving lifetime achievement awards from the International Symposium on Equine Reproduction. © Stephen Patton, University of Kentucky. While it might seem surprising that two of the five inaugural ISER awards were given to former Cornell polo players, Antczak offered a possible explanation for this unlikely event. When he and Zent were students at Cornell, they were mentored by Cornell’s legendary polo coach, Stephen Roberts, who began a tradition of excellence in the sport that continues today. Roberts, who died in 2005, is credited with initiating the so-called “split string” approach to assigning horses to visiting and home teams. In intercollegiate polo, players travel to away games and ride horses maintained by the hosting college. Each horse plays two of the four periods in games, and Roberts designed a method that allowed each horse to be played by both the visiting and home team. The tactic leveled the playing field and meant that the quality of the players, not their horses, determined the outcome of the games. Another of Roberts’ major achievement was making polo accessible to students of modest means by operating a no-frills program. 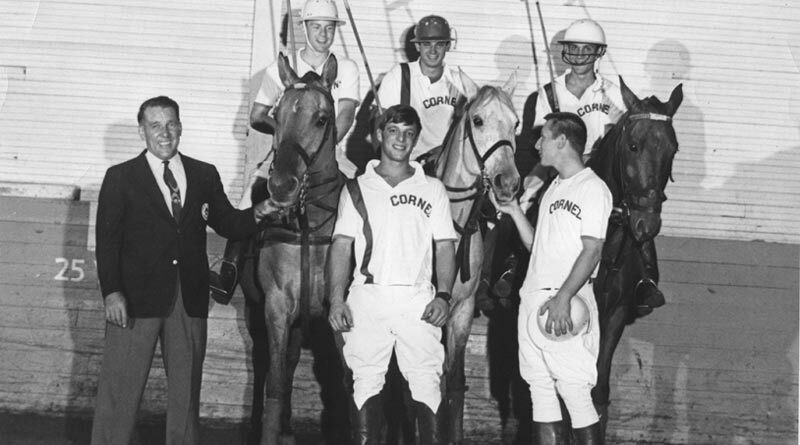 He developed strong connections with polo players around the country who donated horses to Cornell and ensured that each player participated in the chores necessary to maintain the Cornell polo horses in top condition. Roberts had another full career outside of his polo coaching duties as a professor in Cornell’s College of Veterinary Medicine. He was chairman of the Department of Large Animal Medicine, served on many national committees in veterinary medicine and authored a widely used textbook on veterinary obstetrics and reproductive medicine. With Roberts at the helm, the Cornell polo program attracted scores of students eager to gain acceptance to the veterinary college, and Antczak said it is not altogether surprising that two Cornell polo alumni advanced to careers in equine reproduction. Antczak and Zent, who attended Cornell a decade apart, first met while playing in the Cornell Veterinary Faculty vs. Veterinary Alumni polo matches in the 1980s that raised funds for the Cornell polo teams. Both veterinarians learned to play polo after they first arrived at Cornell. Antczak, who grew up riding horses in Waterbury, Connecticut, was elected captain of the Cornell polo team in his senior year. Zent began riding horses in his hometown of East Aurora, New York and worked at the harness track at the Buffalo Raceway. After transferring to Cornell from Oklahoma State, he played polo for a year and then entered the veterinary college, and continued on the team for another year. Since meeting at a polo match, the two veterinarians saw each other frequently at Cornell, in Lexington and at equine conferences around the world. Zent was president of the Society for Theriogenology and a committee member of ISER, while Antczak has given lectures on equine reproduction around the world for the past 25 years. They didn’t expect to meet at ISER’s Twelfth International Symposium last July and were surprised to find just after arriving that they were two of the five recipients of the Lifetime Achievement Award. “I sort of felt like there were a lot of people who had maybe done more than me. Most of what I’ve done is clinical, but I was proud to get it,” said Zent, who, despite his modesty, played a major role in developing the Hagyard Equine Medical Institute into one of the premier centers in the world for equine medical care.